Educating our children is one of the most important responsibilities we have. A person who cannot read, write or use mathematics faces serious obstacles in life. The quality of the education one receives is directly related to the knowledge and skills he or she has at the conclusion of the education program. 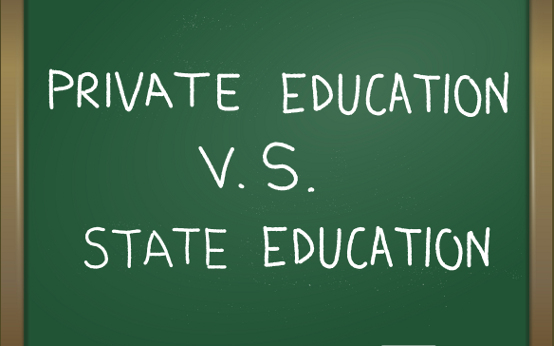 Private education has consistently produced better results than public education. Why then would the president of the United States condemn private education, even saying it is “anti-government” to use it? I’m totally flabbergasted by his public remarks made just a couple of days ago to national media. Private school students generally perform higher than their public school counterparts on standardized achievement tests. Private high schools typically have more demanding graduation requirements than do public high schools. Private school graduates are more likely than their peers from public schools to have completed advanced-level courses in three academic subject areas (see table). Private school students are more likely than public school students to complete a bachelor’s or advanced degree by their mid-20s (see table). It would seem to me that our priority should be in properly educating people, not filling them with propaganda. What propaganda you ask? When an 8 year old boy is told he can cross-dress without telling his parents, that he can use the women’s restroom instead of the men’s room, that is propaganda. It’s promoting social values, or I should say “lack of values” when school is to teach children reading, writing and arithmetic. It’s these so-called “social values” I’m so concerned about, being Christian, as well as the lack of education our children receive. The problems of American public education in 1977 examined in this article are not trivial, and it is not unthinkingly alarmist to speak in terms of hazards or even of perils. They extend from the decay in effi­ciency of the provision of conven­tional school services such as train­ing for literacy, to the even more serious hazard of placing fundamen­tal principles of constitutional de­mocracy in grave jeopardy. The first to be examined will be the deterioration in schooling effec­tiveness. The second peril is the growing threat of a large and ex­panding educational bureaucracy. The third is the increasing educa­tional breakdown caused by strikes of teachers. The fourth is the peril of breakdown from strikes of taxpayers facing school bond issues. Fifth, there is the potential bankruptcy of many remaining religious schools brought on by unfair competition from the public system. The sixth is the possibility of takeover of the government-provided system by strong ideological groups who see it as the cheapest and most effective way of public indoctrination. Seventh, and most importantly, there is the growing danger to con­stitutional democracy itself from the silent gradual eroding of the power of individuals to use their property and incomes in ways that respect their individual preferences as against the preferences of the ad­ministrators of the dispensations of government schooling. Public education has turned into a sham and a scam. Disciplining students and guiding them in the right way has been abandoned. It’s time for the majority-population of Christians to join together and raise their voices to challenge such unintelligent statements as Mr. Obama’s.Let’s revive our national values to those that caused the U.S. to rise to become a major world power and to return to be an example to the world that it once was. “Never talk about religion and politics! It causes division.” I hear those words so often that I feel most people subscribe to it. As one person tweeted, “Those are the 2 subjects I never participate in. It never leads to anything good.” And another, “The only thing that it leads to is flame wars.” I understand the reluctance of sparring with others about the two most important things in life, but it is because they are so important that we should be talking about them both. Most people hate conflict. “Why can’t we all just get along?” is the sentiment of most peace-seeking people. But talking about religion and politics isn’t the problem. The problem which we name conflict comes from a clash of ideas which few people can sort out effectively. There is little chance of reaching any agreement when you have two or more people who share different views on these life-changing subjects. Conflict, however uncomfortable, is inevitable when you talk about anything important with people who have different views on the same subject. But religion and politics matter — they are the only two subject that really need to be talked about if we want to change the world we live in. For the Christian, the thought of never talking about religion is directly contradictory to Jesus’ command to preach the gospel to every living soul. Do you think that may be the reason the devil came up with those words in the first place? If he can silence people from sharing the good news about Jesus Christ, he’s already succeeded in his goal to silence us. Christians are often reluctant to share the good news that saved them because they don’t want to offend people around them. The offense we experience often goes beyond being given a cold shoulder. It can mean the end of friendship and sometimes even the end of a job. I understand wanting to keep peace with those around you, but at some time the gospel has to be brought up if we are to carry out our Lord’s commission to evangelize the world. Politics, on the other hand, is something we are not commanded to speak about. Jesus never told us to go talk about politics. But if you want to be an effective witness of Jesus Christ, it is unavoidable. We live in a social-economic-political world. When elections come up in so-called free countries, we have to decide who we are voting for. We want to select the best candidate, even if it’s both choices are not good. The only way we are going to know who to vote for is if we explore what those candidates stand for, what they’ve done in the past and what their character is like. We need to talk about these things, not only to get a fuller picture, but so that we can help others make better decisions when they go to the polls. Proverbs 4:7 The beginning of wisdom is this: Get wisdom. Though it cost all you have, get understanding. Understanding what’s going on is a requirement if you want to be wise. This brings up the subject of “world view.” Christians have a different world view than non-Christians. We believe in a Creator God who loves everyone and wants everyone to come to Him to receive all He has to offer. Non-Christians believe a plethora of other things, and it is those people we want to reach. If we all sit around in our cozy little Christian gatherings, we may be edified, which is good, but we need to bring others into the fold so they can be edified too. The Christian lifestyle is one that exhibits Christ in character first, and then in our words and deeds. A silent Christian who never talks about his or her faith is relatively sidelined in the great work Christ is spearheading. II Timothy 4:2 Preach the word; be prepared in season and out of season; correct, rebuke and encourage–with great patience and careful instruction. These words to Timothy show us that there will indeed be conflict in presenting the gospel to others. In fact it is we who are to introduce the conflict by correcting and rebuking. Those who believe we encourage. We do all this with “great patience” because we know there will be conflict regardless of how “nice” and “politically correct” we are. The reason for preaching the gospel goes far beyond our petty uncomfortable feelings. for kings and all those in authority, that we may live peaceful and quiet lives in all godliness and holiness. who wants all people to be saved and to come to a knowledge of the truth. Matthew 10:16 I am sending you out like sheep among wolves. Therefore be as shrewd as snakes and as innocent as doves. Use wisdom on when to speak and how to speak to others. It’s not science, it’s walking by the spirit. I’s not technique, it’s God working within you to will and to do of His good pleasure (Philippians 2:13). Speak what God puts in your heart to speak and don’t fear mankind. Notice that the amendment does not prohibit religious people from serving in the government of the United States. That “separation” does not exist and neither should it. The amendment doesn’t prohibit the free exercise of religion, even in politics, it guarantees it. The most destruction to our nation has come when non-Christians have governed the helm. I’m not saying every Christian president was perfect for none were and no Christian is perfect. But those who have not been Christian have done their utmost to pass legislation that goes against the very fabric of Christian faith. 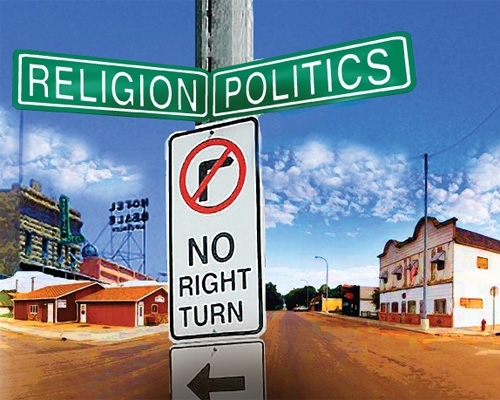 I make it a point to bring up “religion and politics” whenever I can because those are the two most important subjects in life. I love my father God and our Lord Jesus Christ and I want as many people as possible to join us in the kingdom of God’s Son. I also care about our living conditions so we can prosper and be in health so we can move the Word of God over the world. That is obviously the area of politics. But I don’t seek to cause arguments. I seek to invite reconciliation. As long as I keep my attitude on mark, then God can continue to work within me to accomplish what He wants through me. We are coming up to another election in the United States. Get the facts straight on who is running and get out there and talk about it. We may have to choose the lesser of two evils, but if that’s the only choice we have, we are better choosing the lesser of the evil rather than not casting our vote at all which often assures the most evil of the two wins. We have a strong voice because of our sheer numbers here in the United States but staying silent will do nothing to get that voice heard. I encourage you to ‘bone up’ in the faith. Stand strong. Be who God has called you to be. Speak my brothers and sisters and do not stay silent. Don’t let political correctness stop you. Don’t let fear captivate you. Speak the Word of God with boldness and the God of peace will be with you. We live in a time that is testing our values to the limits. Legalized homosexuality and legalized rights to kill babies in the womb are just two of the problems we face on a daily basis. What are we Christians supposed to do? We are maligned by our beliefs, ordered by the government to do things we don’t believe are ethical, and are subjected to a mass of attacks from every front. Christianity is under attack in the world and the United States is no exception. God has clearly stated what our values should be in His Word of truth. Those values include having integrity, being honest, working for a living, supporting those less fortunate, and the value of respecting life itself. What are we to do when there is such widespread perversion of Christian values? The only response we need is to stick to our values, no matter what. If we aren’t willing to suffer for what we believe in, what good are those beliefs? I’m not advocating that we should suffer for standing up for what we believe, for no-one should suffer for such things when those beliefs are centered in truth. However we need to be ready to suffer, and if necessary, suffer as all of God’s people throughout the ages have. We have plenty of examples in God’s Word of those who stood for the truth. Here’s one. Saying, Did not we straitly command you that ye should not teach in this name? and, behold, ye have filled Jerusalem with your doctrine, and intend to bring this man’s blood upon us. Did you notice the solid conviction on God’s Word held by Peter and the other apostles? Those words were spoken at a legal hearing, akin to you saying the same thing to a judge in a court who is ordering you to do something contrary to God’s Word. These men who spearheaded the move of Christianity in the very early days were more willing to die for what they believed in than most Christians are today. So this begs the question, “How Christian are you?” How convicted are you to what you believe? Are you willing to not only suffer shame for Jesus’ name but to die for him if necessary? Or will you fold under pressure and do whatever the opposition says? I tell you there’s a time coming when people will be forced to confess a different God and if they do not, they won’t be able to buy or sell — they won’t be able to feed themselves or their families. Unfortunately for them, many will succumb to the pressure and “take the mark” rather than let their families perish. But God clearly says not to take the mark for doing so rejects Him. I won’t be around during that time, and if you are Christian, neither will you, but for those people who will, it’s better for them to die rather than disobey God. Death is not final. God will raise them up again. But those who impose such a law will not fair so well in the long-term. How Christian are you? We are going to be going through some terrible times in the United States and the rest of the world. By terrible, I mean exactly what I said. I’m sorry to have to report this to you, but expect the worse. Things will not get better, only worse. You could say we are entering a time for our “last stand.” Will you stand or will you fold? I pray you stand firm, no matter what the cost because truth is worth it. Jesus Christ is worth it. God is worth it and so are you because of what Jesus did. When Jesus returns he shall right all things. Any pain and suffering we experience now cannot compare with that which is to come. How do I know? Because I know God’s Word to some degree, and it plainly says so. Romans 8:18 18 [But what of that?] For I consider that the sufferings of this present time (this present life) are not worth being compared with the glory that is about to be .. I Corinthians 16:13 Be alert, stand firm in the faith, be brave and strong. Fear not, for God and our Lord Jesus Christ are with you. There are many things happening in our world today that leave Christians grappling with a good question: What is the appropriate Christian response to these things? It’s a question that is perplexing so many Christians that I thought I’d approach the subject here and see what you think. I don’t claim to have all the answers, but I have a fair understanding of the Word of God which I believe provides all answers to life. It’s through the knowledge of God, revealed in God’s Word that we have all things that pertain to life and godliness. Furthermore God has called us to “glory and virtue.” Our response then has to be toward that end and has to be wrapped up in God’s ultimate plan for the universe. So where do we start? The first thing I believe we need to do is get a grasp of the world from God’s perspective. We need to see the world as God sees it. Only God’s Word reveals that. What is your “world view?” See if your world view matches what God reveals in His Word of truth. II Corinthians 4:4 In whom the god of this age has blinded the minds of them who believe not, lest the light of the glorious gospel of Christ, who is the image of God, should shine unto them. The “god of this age” is Satan according to the Bible, but let’s not forget that God is in complete control. It’s God’s will that, at this time, the devil is the “god of this age.” Don’t worry, he won’t be in the next age when Christ rules from Jerusalem. The devil will be held in chains during the millennial reign of Christ on earth, but until then this is what we have to deal with. But God has not left us powerless to deal with the strategies of the devil. Christ has provided strength and ability to you in the gift of holy spirit with which you were endued when you confessed Jesus is Lord and believe God raised him from the dead. It’s in that spirit of God within you that you have both the wisdom and the strength to both perceive and stand against the devil’s strategies. And what might those strategies be? If you take a look on Google you’ll find entire lists of strategies the devil uses such as deception, diversion, discouragement, bribery, etc. While these are true, I wanted to say what others are not saying because all of these other strategies the devil uses are toward an ultimate end and are not ends in themselves. When Jesus was tempted in the wilderness, the devil offered him the kingdoms of this world in exchange for Jesus’ worship of him as God. Notice that Jesus did not deny the devil had the ability to give Jesus the kingdoms of the world. Jesus response indicated that yes, indeed, the devil could give him all these things but the Scriptures command worship to God alone and not to any being created by God. This response, using the written Word of God, is what shut the devil’s temptation down and made it of none effect. Lesson: The devil can be shut down by responding with the written Word of God that applies to the given situation. Do you see how important it is to know the Word of God and adhere to it? While the devil offered that of which he was in control of, Jesus chose to worship God and to serve God only. No amount of bribery could dissuade him. Think of Jesus’ response in contrast to someone in the media today such as Katy Perry who claimed in an interview on national television that she “sold her soul” to get where she is today. When asked who she sold it to she said something like, “to the Chief.” Katy Perry is just one example of many others in the entertainment industry who, for fame and fortune, have sold out to God’s arch enemy. Katy, who says she was a Christian before that, surely could have answered the same way Jesus did but I guess she couldn’t bare the thought off not having fame and fortune. My heart goes out to her and I pray God will work in her heart to get her back on the right path. Between racial divides, gender wars, the Islamic assault on the entire world let alone Christianity, and the economic dilemmas we face on a recurring basis, Christians are often bewildered on how to respond to these things. I’d like to propose an answer to these questions on two fronts: the Christian’s personal response and the corporate Christian response. I believe both of these are important because we are Christians individually first, and we are placed in the universal Christian church, the body of Christ corporately. My response to all of these things is simply to live what the Word of God teaches. My response to the homosexual agenda is to be heterosexual. My response to discrimination is to be non-discriminatory. My response to stealing and looting is to not steal and to not loot. Statistics claim that 75 to 80% of residents in the United States claim they are Christian. I wonder how many of those so-called Christians were among the rioters and the looters in Ferguson and in Baltimore. I just wonder how many who claim to be Christian are not responding as Christians are called to respond. If the statistics are true, then surely many of the rioters were Christian also. I’m not talking about peaceful demonstrators. I believe there is room for dissent and that requires peaceful demonstrations. But violence and theft are out of the question for Christians. Wouldn’t you agree? We cannot control what others do, we can only take heed unto ourselves. The proper Christian response to anything that violates God’s order of things is simply to be and do as God prescribes in His Word of truth. If we all did that, what a new day it would be in the United States of America and in many other nations of the world. As Christians we are part of the body of Christ. This strong analogy is used in God’s Word to show that we are Christ’as arms, hands, heart and feet. We are his legs taking the good news of his accomplishments and his offer of life to others. But are we acting as one body? Are we unified in our response to these societal ills I’m speaking about? Sadly, I don’t see that we are. I see just as much division in the Christian church as there is in the world. I see entire Christian denominations forsaking the Word of God in the area of marriage to conform with the new anything-goes sexuality being promoted heavily today. I see Christian churches holding “inter-faith dinners” and “inter-faith conferences” during which Jesus is not presented as the only way to God as he said, but as an alternative just as valid as the other “faiths” invited to attend. This is not Christian apologetic by any means. Rather it is Christian surrender to the principalities and powers of this world. Unless we can agree on the Word of God concerning these things, we will never have unity among Christian denominations and organizations. We will only have a weak, spineless defense as the majority of Christians mindlessly succumb to their denominational views. Without unity, we cannot mount a successful offensive against these strategies of the devil. Christianity is not a threat to the devil when the Christian church is laying down on the job. He laughs at us while he carries out his will in opposition to the will of God. He sees more and more churches falling for his strategies while still claiming to be “Christian.” These churches are part of the problem, not the solution. Ultimately it boils down each of us as individual Christians to not only live the Word of God but to take a stand for God on these issues. Sitting back in our homes and complaining about what’s going on will do nothing but give you a stress-related disease while partaking in those very things just silences you altogether. It’s up to each of us to live as God says we should live, and to take an active public stand for what God says is right. Lacking the public stand we are no more powerful than a light behind a closed closet door. You may see a little light around the edges but darkness will still prevail, until you open that closet door and let the light shine out. The closet door, of course, in this analogy is the actions you take to make a difference in society based on the Word of God you believe and live. When enough individual Christians in a church take an active stand on the written Word of God, the clergy will be forced to change or leave to be replaced by those who are willing to uphold the truth of God’s Word. Never think you cannot make a difference. One person standing can influence another close to you, who influences another, and so on until there are a large enough number of people to demand change for the sake of truth. I heard a prominent politician claim that Christianity doesn’t need any supporting legislation on the freedom of religion, “because you’ve already won — 75% of Americans are Christian!” It’s a fallacy to think we have that large a number of practicing Christians in this country. They may go to church once in a while, or even every week or twice a week, but are they living the Word of God and taking a stand for it in the society in which they live? That’s where the rubber meets the road. That’s where spiritual success or failure hinges. We need a concerted effort among Christians with a unified voice before we can effect any change in society. As long as we have a large majority of “closet Christians” or “nominal Christians” we will never mount an effective offensive. We don’t need all supposed 75-80% of Christians to do this, because a unified active voice of even a small number can cause others to stand up and take notice. But I don’t see much if any of a unified effort being made to combat these strategies of the devil in this age. I encourage you to read the parable of the Seed and the Sower and determine which type of ground you represent. In that parable, Jesus describes four different types of ground — only one of which is ‘prepared’ for the seed that is sown into it. If your heart has been prepared then you are part of the solution. Live God’s Word and take an active stand on it in this world. Measure your results not by the crop that is produced but by the seeds that you plant. Remember that God gives the increase and many times it takes quite a few seeds, planted by different individuals over time, before a harvest can be seen. You do your part and God will do His. Live God’s Word and take a stand for it in your life, in your church or fellowship, and in this world. Let’s see what God does through us as we get more unified on His Word in practice and in our interactions with others. The heart of the gospel of Jesus Christ is that through his sacrifice, we have peace with God and with each other. God is not at war with mankind, but is reconciling all to Himself through the blood of His Son on the cross. The time will come when God’s wrath will sweep the earth but that day, however soon to come, is not here yet. When that comes, Christians will be taken off the planet as described in numerous passages in the Bible. Until that time comes, we need to pursue peace with each other in the body fo Christ and with all men. This post is a follow up on my previous post on the topic of freedom of speech in relation to the Mohammed cartoon contest that was held in a private gathering in Texas. Two Muslim gunmen were killed in their attempt to shoot down those who they felt were blaspheming their prophet. In that post, my emphasis was on our God-given right to freedom of speech and expression. My position is that that freedom should not be abridged under any circumstances. I stand by that position and always will. This post is to clarify my position in how we responsibly use that freedom. The contest’s winning cartoon entry was not degrading in any way. It showed a caricature of Mohammed saying, “You cannot draw me.” A second cartoon character, in the act of drawing Mohammed said, “That’s why I’m drawing you.” It’s a clever cartoon emphasizing people’s right to say and believe what they want. This flies in the face of an event held shortly before, at the same facility, by a Muslim consortium. In that meeting, Muslims debated on how to use Sharia law to limit free speech in the United States. They want to curtain any speech in any form against Mohammed, the Koran and what they call their superior religion. I want to point out that the cartoon contest was not held by a Christian or a Christian organization. There were Christians there, I’m sure, and the winning artist was an ex-Muslim who may have converted to Christianity. But the contest was not to promote the gospel of Jesus Christ, it was specifically held to demonstrate the human right to free speech without compromise. I think the purpose of the event was not to inflame Muslims but to reinforce the right to speak out against anyone or anything whatsoever regardless of who it might be or what the issue is. 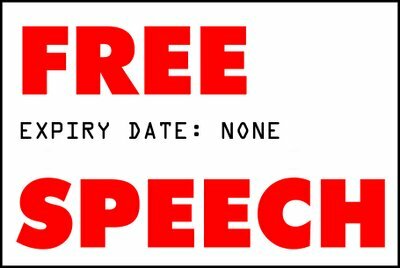 I support free speech in any form, no matter how vile or disgusting to anyone whatever is produced may seem. That was the purpose of passing the second amendment to the Constitution of the United States. It is by the suppression of free speech that people are first enslaved and our founding fathers recognized that and prohibited any attempt to curtain it. We must keep this freedom intact no matter what the cost. However when we are talking about reaching out to those who don’t yet embrace Christ with the gospel of peace, peace is what we are offering to people. We are to walk in love, to walk in light, and to walk circumspectly in this world. Walking circumspectly means to not take undo risks and to walk with precision. We don’t want to incite people but win them to Christ. We don’t condemn people, we invite them to believe the truth. We don’t fight people, we wrestle against spiritual forces of darkness using the rightly divided Word of God. Let me point out that mockery is in the Bible and is an acceptable to God as a powerful form of communication. So Obadiah went to meet Ahab and told him, and Ahab went to meet Elijah. “I have not made trouble for Israel,” Elijah replied. “But you and your father’s family have. You have abandoned the Lord’s commands and have followed the Baals. So Ahab sent word throughout all Israel and assembled the prophets on Mount Carmel. Then Elijah said to them, “I am the only one of the Lord’s prophets left, but Baal has four hundred and fifty prophets. Get two bulls for us. Let Baal’s prophets choose one for themselves, and let them cut it into pieces and put it on the wood but not set fire to it. I will prepare the other bull and put it on the wood but not set fire to it. So they took the bull given them and prepared it. So they shouted louder and slashed themselves with swords and spears, as was their custom, until their blood flowed. Midday passed, and they continued their frantic prophesying until the time for the evening sacrifice. But there was no response, no one answered, no one paid attention. Then Elijah said to all the people, “Come here to me.” They came to him, and he repaired the altar of the Lord, which had been torn down. With the stones he built an altar in the name of the Lord, and he dug a trench around it large enough to hold two seahs of seed. “Do it again,” he said, and they did it again. “Do it a third time,” he ordered, and they did it the third time. The water ran down around the altar and even filled the trench. At the time of sacrifice, the prophet Elijah stepped forward and prayed: “Lord, the God of Abraham, Isaac and Israel, let it be known today that you are God in Israel and that I am your servant and have done all these things at your command. That is pure mockery. The reason for the mockery is to show how ridiculous was the thought that Baal was the true God. Now I can’t go into detail here, but modern Muslim worship is directly related to Baal worship so long ago. Look how God dealt with it then, through Elijah. He taunted the followers of Baal to shame them so they would see the folly of their false beliefs. II Corinthians 5:15 And he died for all, that those who live should no longer live for themselves but for him who died for them and was raised again. So how do we reconcile the fact that God used mockery through Elijah to confront the false prophets of Baal with the fact that we are to share the gospel of peace? The context of that cartoon contest was in direct response to Muslims planning to use Sharia law in the United States to curb free speech so nobody could talk ‘bad’ about the Muslim faith. I believe the context justified the gathering. I say this especially in light of the fact that Baal worship, condemned by God in the Bible over and over again, is related to the Muslim “faith.” We cannot let a false religious belief shape what we can or cannot say, it’s that simple and that important. The goal of the Muslim event was to stop the mouths of those who oppose their false religious system that they want to impose on the whole world by infiltration and, in the case of militant Muslims, by force. Shutting people up would serve them fine but would prohibit speaking the truth in love which is what God has commanded Christians to do. My heart is to invite people to share in the salvation Jesus Christ procured through his self-sacrifice on the cross. I love all people and I staunchly reject all false teachings and the systems built around them. If the context calls for it, I will speak, draw, or do whatever is necessary to convey the heart of God in that matter. But my goal is to win people not offend them. It’s true that speaking the gospel of Christ will offend some people regardless of how “careful” you are to choose your words and gestures. However we cannot let that prevent us from speaking. Let the cards fall as they will. Perhaps this verse will clarify what I am saying. II Corinthians 2:14-17 But thanks be to God, who always leads us as captives in Christ’s triumphal procession and uses us to spread the aroma of the knowledge of him everywhere. To the one we are an aroma that brings death; to the other, an aroma that brings life. And who is equal to such a task? Our words bring life to those who believe them and death to those who don’t. We don’t decide the outcome ourselves. We just speak. In conclusion, consider the context in which you say and do things. Our aim is not to offend people but to win them however there are times when mockery is needed, there are times when it is more harmful than good. When you walk by the spirit of God, you will know how to handle each situation. That, my friend, is what walking circumspectly is all about. Two gunman with intent to kill pulled up to a free speech event in Garland, Texas and opened fire, but were killed themselves after shooting a security guard in the ankle. Participants at the event raised the United States flag, sang the national anthem and prayed for the injured, unarmed security guard. The security guard was rushed to the hospital, treated and released. The event itself featured a $10,000 prize to the person who drew the funniest caricature of the Mohammed. It is significant to note that the winner of the contest was himself an ex-Muslim who converted to Christianity. Not surprisingly, many have come out to condemn — not the gunman — but the event itself, claiming it was insensitive and offensive to Muslims. Donald Trump was among those who criticized the event. But why condemn the event and not the gunman? Is this event going to turn into an assault against free speech? I pray not. When you coddle offenders and give them an excuse for their actions while condemning our God-given right of free speech, something is wrong. Were the Gunman Targeting Someone? It’s possible and conceivable that the gunmen were specifically targeting someone. The keynote speaker at the event in Garland was right-wing Dutch politician Geert Wilders, who was placed on an al Qaeda hit list for his film “Fitna.” In 2011, Wilders was cleared of charges of inciting discrimination and hatred with the movie. The event was held by the Freedom Defense Initiative, an anti-Muslim group which has been labeled as a hate group by the Southern Poverty Law Center. Geert Wilders has led high-profile anti-Muslim events in the past and he may have been the ultimate target of the two gunman who arrived just before the event ended. The event itself was in rsponse to an event held at the same facility in January called, “Stand with the Prophet,” which was meant to counter Islamophobia after the Charlie Hebdo attack. That event drew several hundred attendees and about 200 protesters, and went off without incident. Perhaps he didn’t read the news. The only people who were killed where the perpetrators. My take on this is that the event will be used by the far left to mount an attack on free speech itself. There are those who want to call any kind of dissent hate speech if it offends another group. This is an attack on the concept of dissent itself. If people are prevented from dissenting, we have lost our freedom of speech entirely. No matter what you believe, if you voice those beliefs publicly you will offend someone whether you intend to or not. That’s just the nature of opposing ideas clashing. The problem is not in free speech but in violence. In my estimation, when people condemn those who exercise their right to free speech rather than the terrorists who violently oppose it have no idea of what true freedom is. If someone ridicules Jesus, I don’t like it. But I don’t get a gun and blow them away. They have the freedom to believe what they want and to express it as they like. I don’t get upset about this type of thing because, to me, it simply shows the ignorance of the person putting forth their ridicule. Their words and actions cannot harm me, and could never harm Jesus. 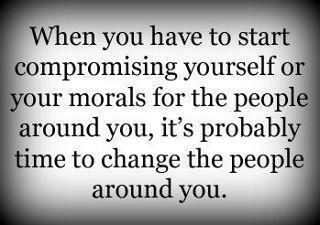 It’s time some people grew up and realize they can’t control everyone else or make them believe what they do. That’s what freedom itself is all about. I don’t know what you think about the Mohammed cartoon contest, whether it was wise or insensitive, but in no way should anyone condone violence on anyone expressing what they think about anything. When I was a child my mother taught me that, “Sticks and stones can break my bones but words can never hurt me. Perhaps those two gunman never learned that concept. Have you?